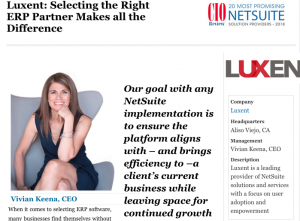 Aliso Viejo, CA – December 10, 2014 – Luxent, a leading ERP and CRM service and solution provider and two-time Inc. fastest-growing company, announced that it has joined the NetSuite Solution Provider Program to address the growing demand for cloud-based business management solutions among mid-market manufacturing and distribution companies. The leading IT services and solutions firm can leverage its extensive technology experience and vertical market expertise to implement, customize, integrate, and extend NetSuite’s ERP, ecommerce and CRM cloud solutions for manufacturers and distributors looking to leverage cloud-based business management suites to more efficiently run their core business processes, such as financial management, warehouse and inventory management, customer service, marketing automation, CRM, and analytics. Luxent provides full implementation and technology consulting services for Salesforce.com and other software solutions in a variety of markets, including the manufacturing and distribution industry. After realizing that companies are moving to cloud-based solutions for rapid ROI, a lower total cost of ownership, and greater accessibility, Luxent began growing its cloud practice to become a leader in implementing and integrating the best cloud solutions available. “The addition of NetSuite as a strategic partner is key to our company’s vision of bringing the best of the cloud to manufacturers and distributors and we’re excited to provide our customers with cloud ERP solutions and services that complement their businesses and other technology platforms,” said Keena. “At Luxent, we’re committed to helping our customers gain and maintain a competitive edge through effective, integrated technology,” said Keena. 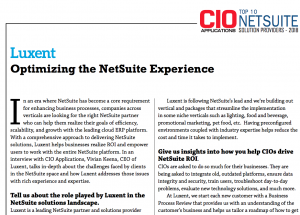 “NetSuite is a great partner to help us—and our customers—reach the next level. Join Luxent and NetSuite for a live webinar on Wednesday, January 14, 2015, which will discuss why now is the time for manufacturers to move their ERP to the cloud.